As a guest at the Oak Harbor Marina you will receive 20¢ off per gallon of fuel up to the amount you pay for a night of guest moorage. This means that if you plan correctly you may be able to get a FREE night of guest moorage! Get the idea? We like free things! The Oak Harbor Marina can accommodate boats from 18' - 70' and offers spacious guest moorage slips with on dock picnic areas, a dog area (complete with a fire hydrant!) and 30 amp power. ​The Oak Harbor Marina accepts individual reservations with the first night of guest moorage paid (non-refundable). 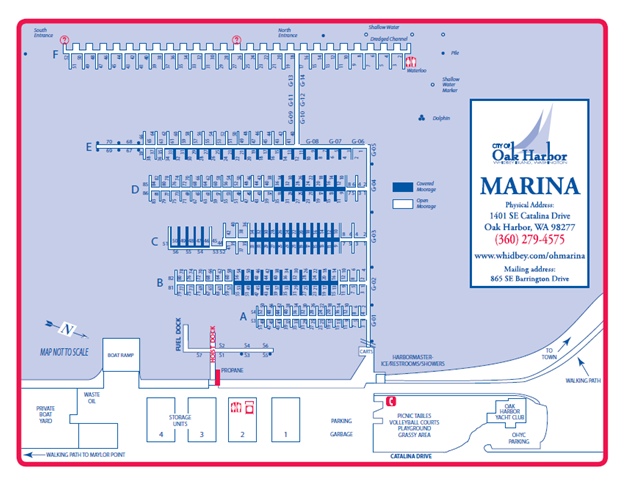 The Oak Harbor Marina accepts guest moorage reservations for any group of 5 or more vessels. Group reservation dates are only reserved if the reservation form is filled out and returned to the Marina office by mail, email, or fax. moorage is located in slip F-01. The slip can accommodate one boat with a LOA up to 40' long. Rafting is not permitted. Reciprocal moorage customers are not eligible for the 20¢ off per gallon fuel discount. If you are not in slip F-01 then you are not in reciprocal moorage and must pay for moorage.